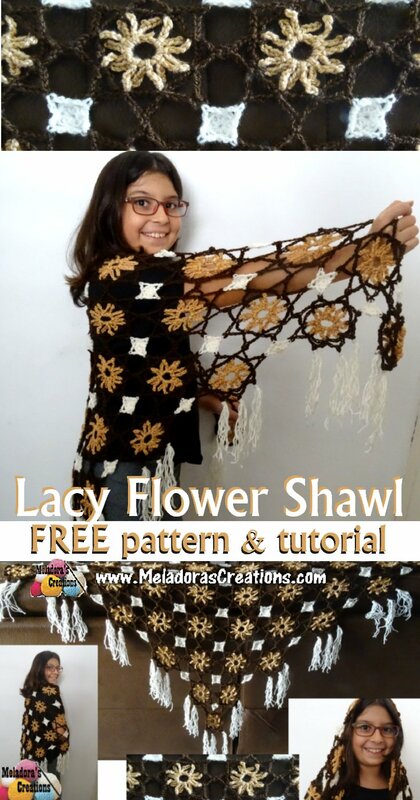 This Free Crochet pattern teaches you how to to make a Crocheted Lacy Flower Scarf using motifs of different sizes and joined as you go. YARN: at least 900 yards of yarn. I used Anti-Pilling yarn because I didn’t want it to fuzz up after a lot of use. 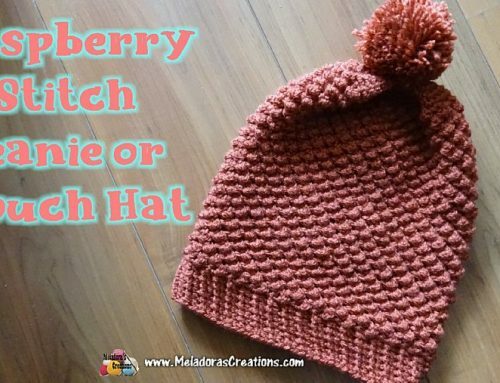 But if you only have worsted weight yarn you can use it, but I would recommend for something like this that you get Anti-Pilling if possible. Also this is 4 ply yarn for the US / 10 ply for AU. HOOK: 4 mm hook, or US you can use G, G is 4.25 mm so it may come out slightly larger. If this shawl is coming out to big, and you want to make it smaller, just do less rows total, this one is 11 from tip to last row. I’m a big gal so this is way I made it big, but if you’re skinny, perhaps you would prefer only 9 rows total. 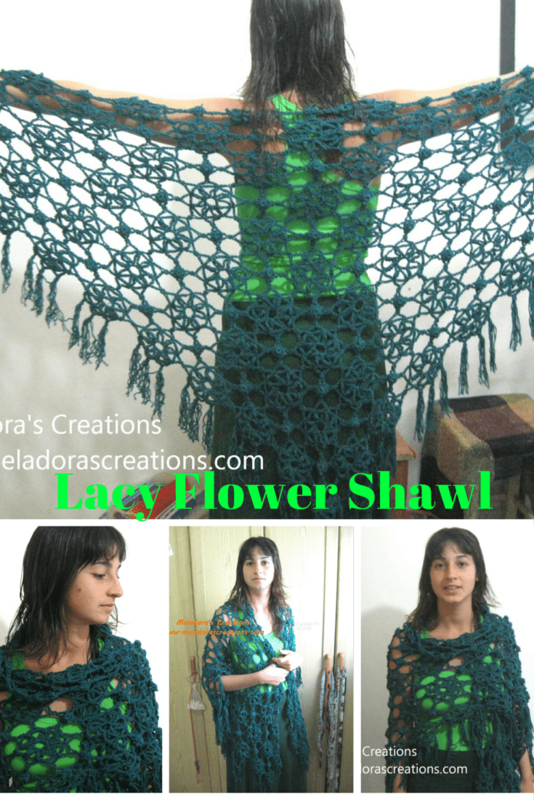 This is the chart you can use to help when making this shawl. 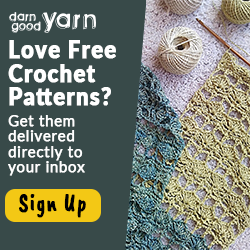 I have 10 large motifs on top, and 11 total rows. ch 10 and sl st into ring, repeat this 7 more times until you have 8 loops total. Then slip st up the side of the first loop. 4 or 5 times, however many it take you to reach the top of the loop. sc into loop, ch 5, then sc into tip of next loop. Repeat of all 8 loops. ch 7, sl st into 4th ch from hook. Ch 3, sl st onto the following sc. Repeat for all loops around. This first motif will be done fully. The rest you will be connecting as you go. sl st onto next sc. After you have your first two motifs connected. Then make a third large motif and connect it at the bottom of the first motif as well. Remember to skip a point in between. 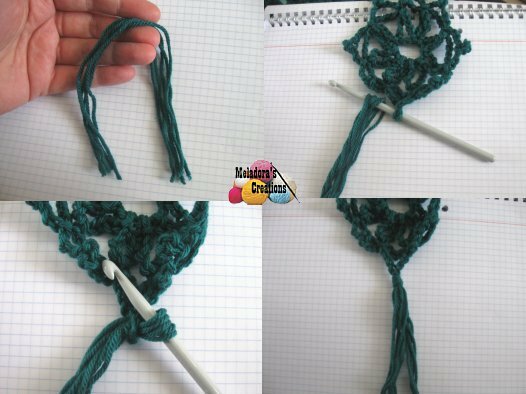 To connect the fourth Large Motif you will start your fourth motif and stop after you’ve made your 5th point. Always make sure you have one loose peak after your connection, because we will be using them later to connect a smaller piece. Ch 3 and sl st to connect at point. Ch 3 and sl st onto next sc. Ch 3, and sl st into beginning st to form a ring. Ch 2 and sl st into one of the middle open connects, ch 2, then sk a st and sl st in next dc. Repeat 3 more times to connect all 4 middle points. Then to connect the next motif, you will stop after your have 5 points made, and using your 6th point, make a connection to the motif on the right, then ch 7, sl st in 4th ch from hook, ch 3, sl st into next sc. Ch 3 and make your last connection to the other large motif by sl stitching on the correct point, then ch 3 and sl st into next sc. 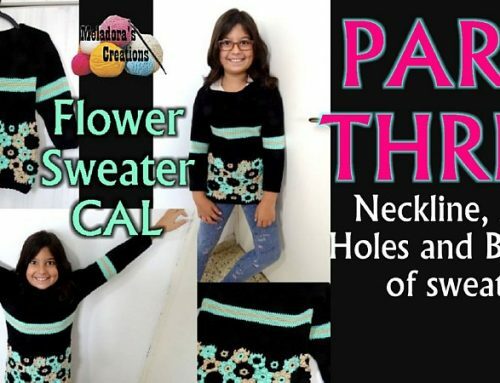 Ch 1 and cut your yarn. I repeated this in a square until I got 6 motifs by 5 motifs. Then I turned the square where the point faced away from me and started adding it diagonally like shown below. 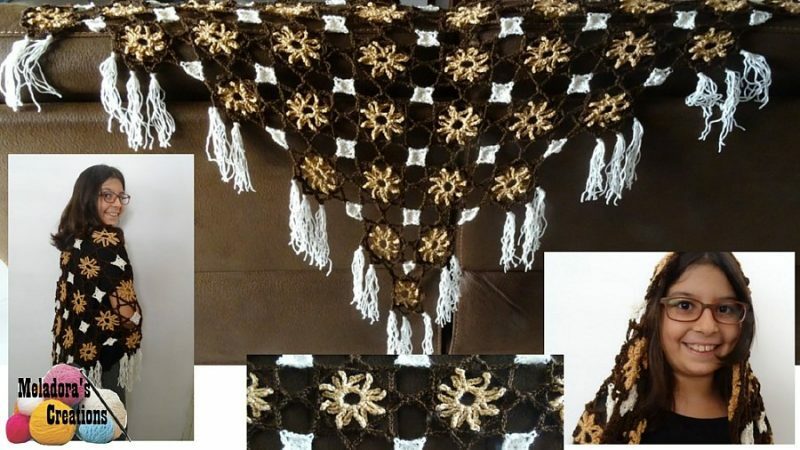 If you wish to not make your shawl as large, then do less row, for instance, try making 9 rows from tip to top and try it on, if you like this size, then finish it up as I will show you below. You can do the same for a child. 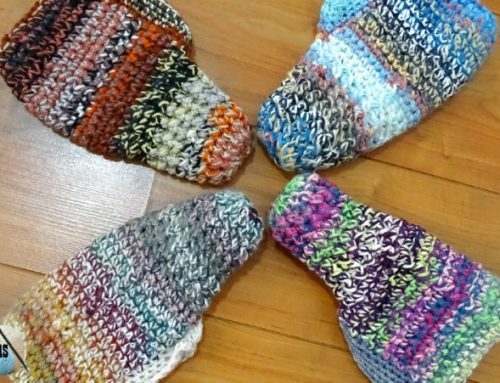 Try making 6 rows for a 5 year old and see if it fits well, if you need to add another row, then do it. Then finish up the shawl as I show you below. 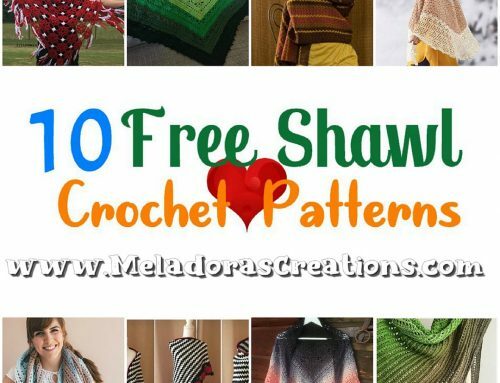 FOR CHILD SIZE SHAWL – Make 10 across and 6 rows total. Ch 3, sl st in beginning st to form a ring. Ch 2, dc 5, sc 2 into ring, sl st into beginning ch 2. * ch 2 and connect to one of the three points, ch 2 and sk a st and sl st onto circle. * repeat for all 3 points. Ch 1 and cut your yarn. Ch 3, sl st into beginning ch to form a ring. Ch 2, dc 3 into ring, sc 2 into ring, sl st into beginning ch 2. Ch 2 and sl st connect to the first motif, ch 2, sk a st, sl st back on circle. Ch 2, and repeat for last point. Ch 1, cut yarn. Find something that is the length of the fringe that you want and wrap it around it 5 times. I used a thin book and wrapped it around the width of it. Then cut the loops at the bottom and remove. You will again be using the same holes you used to make your connections. 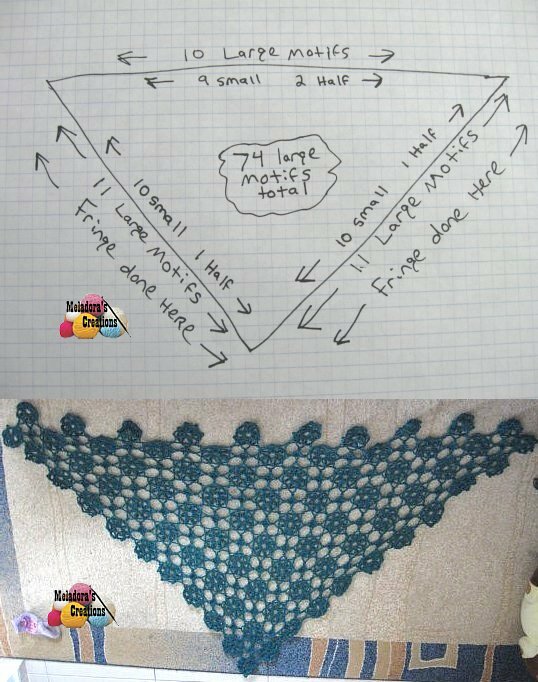 Put a fringe in each one along the bottom of the shawl.